Principal of the Barrouallie Secondary School Galsley Lewis believes that his school could have done better if the students had more of a positive attitude towards their work. Lewis expressed his disappointment with the overall performance to the Searchlight Newspaper particularly in the area of Math where there was a 78% pass last year but had a drastic drop to 28% this year. Lewis said that Barrouallie Secondary got the award for the most improved school, last year but he believes that they will not be a contender in that category this year. Thirty-six students from that school sat the CXC exams this year, 10 got seven subjects, 9 got six and 10 got five subjects. 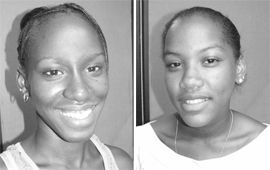 Top student was 17 year old Shanda Cain of Barrouallie who received one 1, three 2’s and four 3’s. Cain told SEARCHLIGHT that she plans to pursue a career in banking or teaching and believes that young people should take education seriously if they want to achieve their goals. The avid netballer also thanked her teachers and mother for motivating her to do her best. Second at the Barrouallie Secondary School was Cain’s best friend, 17-year-old Oteeka Rocque who also advises young people to grab the opportunities in education which come to them despite the everyday challenges they face.